Tired of your laundry room chaos and losing socks to the abyss around your washer & dryer? 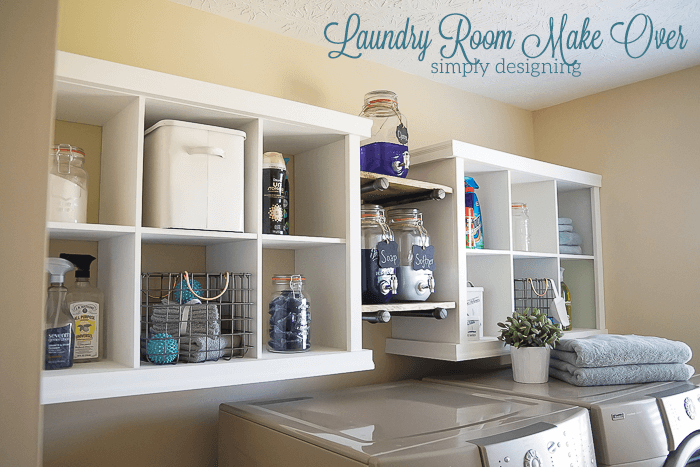 Check out these DIY laundry room makeover ideas & get organized. If you’re like me, you consider laundry a necessary evil. We spend countless hours sorting dirty clothes, matching clean socks and ironing white shirts, yet how often do we enjoy spending time in our laundry room? Regardless of budget, size, or floor plan, a few simple and cost-effective changes can quickly turn a utilitarian room into an attractive and functional room in your home. The trick to making over your laundry room is to make it work for YOU. Whether your style is modern, farmhouse or eclectic, create your space to reflect the rest of your home. When considering a laundry room makeover it’s important to consider what your needs are and revamp your laundry area to meet them. Well, we’ve got you covered. We scoured the web and found 23 of the most clever DIY storage solutions, space-saving laundry room ideas, and decor to help you transform your laundry room. Clear the clutter and maximize floor space at the same time. A laundry basket organizer that is built-in next to a wall is a wise use of vertical space and perfect for small laundry rooms. The bottom baskets can easily be accessed by children who are learning to sort. Make It Love It has all the instructions you need to make your own! A smaller space may call for a sorter with more flexibility. An upright station on wheels is a great way to sort colors, whites and delicates, and provides a top shelf to store a stain stick and detergent. What’s great is that you can roll it out of the way when it’s not in use (which is probably never – where does all the laundry come from?!). Hoosier Homemade was even kind enough to give us a step by step on how to build one. Kill two birds with one stone. Build a washer and dryer pedestal and multitask it by using the space underneath for laundry baskets, cleaning supplies, or whatever your fancy is. Sort by color or by person – paint with chalkboard paint and label away! The greatest mystery in life is where in the world that other sock goes! Now we have a solution for you. String those lonely socks up and leave them there until a mate turns up. Now if we could just figure out where the extra tupperware lids come from! How many articles of clothing have you had ruined, thanks to someone being helpful and switching clothes from the washer to the dryer? Suddenly your maxi dress is decidedly mini! Keep a dry erase marker handy and write those important notes – like dry sweaters on delicate – written right on your machine lid. They will wipe right off! Adding a cover to your front-end washer and dryer gives the room a pretty, finished look. It also provides a large, flat surface for sorting, folding or ironing. Make sure to add a shelf above the counter to house your iron, stain sticks, and other laundry essentials. Find out how to build one yourself! If you’re like me, there never seems to be enough storage space for cleaning products or decor. A few hours, a couple of tools and several cube storage units are all you need for this project . You can even designate a cube for each family member and put them in charge of putting their own laundry away! When you combine the popularity of an industrial look with the cost-effectiveness of materials, you get a trendy looking shelf . Accessorize with some wire baskets for quick and easy open storage. Use these for your washing supplies, spare towels, and more. This storage solution can even tackle that problem. Floor to ceiling shelves with a basket for each person (or stranger!) in your home and a rod for hanging up delicates, shirts straight out of the dryer, or those pieces that make such a racket in the dryer! Although many fabrics, washing machines, and dryers go together, you may still need an option for drying the occasional delicate. Check out these easy-to-follow instructions for a space-saving drying rack. If you’re anything like me, your crib spent more time holding laundry then it did holding a baby. Now you can repurpose it once again as a drying rack! This handy guide should get you on your way. For those items that can’t go in the dryer or might be too big for the dryer, you need a clothesline. Not everyone has the luxury to string one up in the yard – whether it’s due to apartment living, HOA rules, or a lack of space. Now you can outsmart everyone by stringing up an indoor clothesline. That pesky space of six inches (or more) between the dryer and wall, caused by that pesky dryer vent? You know, the one where where you find otherwise clean socks that have fallen behind and are now collecting lint dust? Grab a partner and solve that problem with a dryerbox. Most people have extra space between the washer and dryer, and/or on either side. There is a good chance you do, too. Take advantage of this wasted space with a slim cart designed to hold cleaning supplies. This will also help keep those pesky socks from getting lost. Personally I consider the steam setting on my dryer to be the greatest invention ever. I no longer iron – ever! Some of you though still love those crisp lines and a pressed pair of pants. Save space and time by creating one of these ironing boards to rest atop your washer or dryer. Occasionally the best way to save space is to rethink where your laundry room is going to go in the first place. If all your bedrooms are upstairs or if you find yourself hauling laundry down to the basement daily – it might be time to convert a closet into a laundry space. Who knows – folded clothes might actually make it upstairs and put away occasionally if they are closer to their homes! One of the most annoying parts of doing laundry is dragging hampers through the house to get to the laundry room! Why hasn’t anyone created an easier system? Now you can with this stylish rolling laundry hamper. Even your teens will like having one of these in their room – their dirty clothes might even make it in the hamper occasionally! If your washer and dryer don’t have a room of their own in the home, they can be an eyesore. Fix that problem by creating curtains to hide the appliances and allow them to match the rest of your home. Now you have a way to show your style in yet another place! Laundry rooms are often left stark and boring. Add a little pizazz with some framed artwork that also serves a purpose. These free printables will help you translate common laundry symbols and remember which water temperatures should be used for different colors. Painting cabinets will completely transform the look in any room – and it’s easy and affordable. A laundry room is a great place to start since there are generally very few to paint. Check out these five tips, including before and after photos, for inspiration. Similar to painting the cabinets, painting a room can give it a whole new personality. Give it a warm hue for a relaxing vibe, or a bold color to keep you energized while doing chores. Because it is generally one of the smaller rooms in the home, take the chance to try something new on the walls. Or, learn about how color creates a mood and go from there. Is there anything uglier than laundry soap containers? Lucky for you, you can repurpose beverage dispensers for holding your laundry liquids and even add cute chalkboard labels to them for an extra flair. * Word of warning * – this isn’t a safe storage solution if you still have young children at home – cleaning supplies should be kept away from them at all times! Spare change – it’s like the lottery of laundry day! Combine decor and practicality by creating this cute DIY change jar. Now you know longer need to search couch cushions to scrounge up lunch money – you can just send the kids to the laundry room instead! 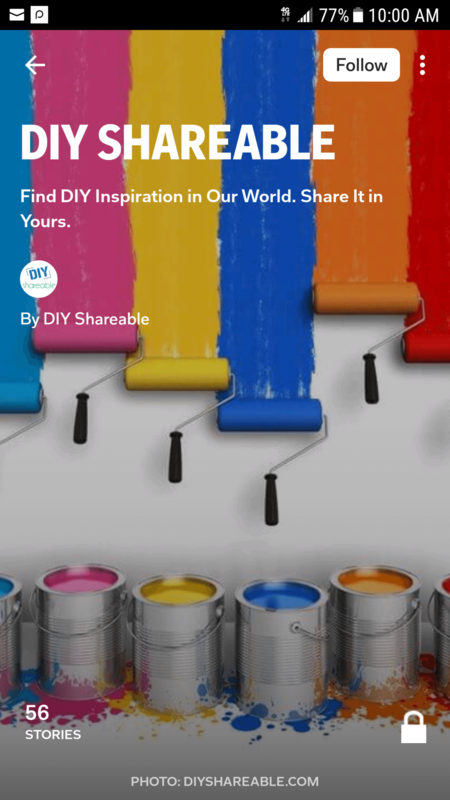 Remember that we love to see before and after pictures here at DIY Shareable so make sure to comment, let us see your laundry room makeovers, and tell your friends about where you got your great ideas!